"There is a new fad now in the air. It has suddenly become chic to be poor ... Nobody bothers any more to camouflage poverty. Quite the contrary ... Your poverty may be poverty in dead earnest, but it is up to you whether it be witty or dull." Sound familiar? While the aforementioned philosophy seems especially consistent with the anti-consumptive consumerism of contemporary post-economic collapse America, the words in question were actually written in 1930. In fact, they were published in Vogue's May issue that same year (and reprinted in the Telegraph today). 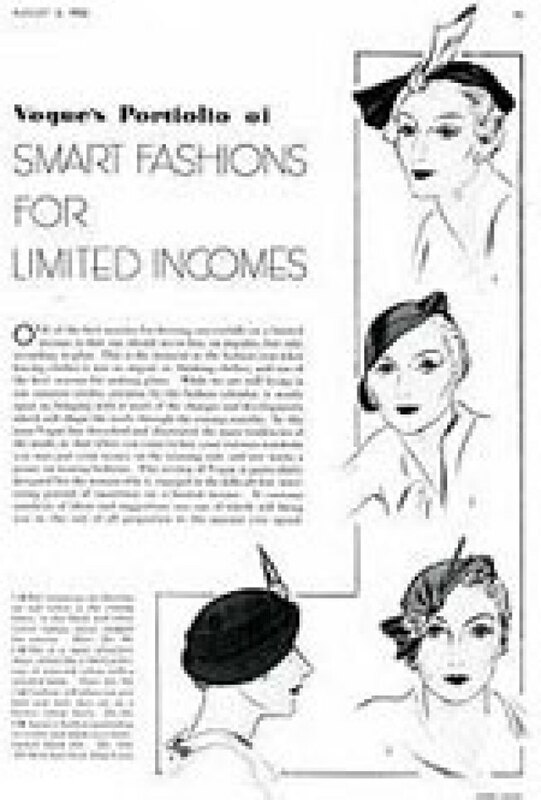 Not only did the 30s boast great foresight with regard to predicting contemporaneous style, the period likewise generated great recession-friendly fashion techniques. For those in reduced circumstances, the magazine recommended adding a tulle flounce to an out-of-date lace frock, with a matching scarf over bare shoulders; alternatively, as fashion was shifting from short lengths to long, “The best way of letting down a skirt is by introducing a fitted hip yoke of material stolen from elsewhere on the frock ...” The magazine [also] advocated buying a “really good frock,” and then reinventing it with accessories. “Starting with a black crêpe evening dress of good material and excellent cut, you can wear it unadorned as one costume. For its second appearance you add a long white crêpe scarf, tied diagonally, and carry it with a white bag. Then you can achieve an entirely different, romantic-looking costume by means of pink roses and a pink bag.” The same issue also contained instructions on how to knit your own striped jumper (the design, incidentally, would look just as chic now as it did in 1932).